According to most sources the time to visit Zion National Park is in spring. Summer is too hot, the birds are quiet in fall, and winter is too cold. That said, there is really no bad time to visit a national treasure like Zion National Park. 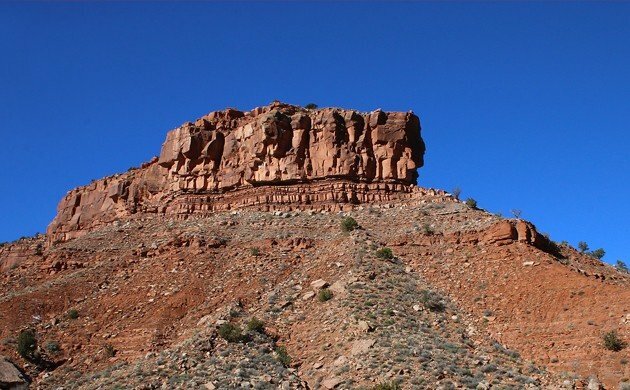 The red rocks against the clear blue sky are simply sublime. I loved the time we spent at Zion and only wish that we had more of it! My visit to the park in southwestern Utah commenced with us (us being me and my family, and an extended number of in-laws, eleven people in total, four of us kids under ten) driving through Zion late in the evening on Saturday, 26 December, in order to get to our lodging just east of the park in Zion Pionderosa Ranch Resort. Though it was nearly dark we were quite taken with the scenery despite the fact that the switchback-laden road was unfamiliar and a bit icy in places. I’m just glad I wasn’t driving! Finding our “cabin” took a bit, mostly because we failed to read the detailed instructions about where to go, but we only got one of our two vehicles stuck and it only took some good ol’ masculine car-pushing to get us back on track. After a delicious dinner and a bit too much to drink we all went to bed early but I was up at dawn the next morning and went for a walk before the bedlam of four kids overran our rather luxurious accommodations. I was very pleased to discover that we had chosen to stay in a place smack dab in the middle of a juniper-pinyon forest, which meant that finding one of my main two target species of the trip, a Juniper Titmouse, was amazingly easy. You couldn’t miss them if you tried, despite their incredibly bland appearance. 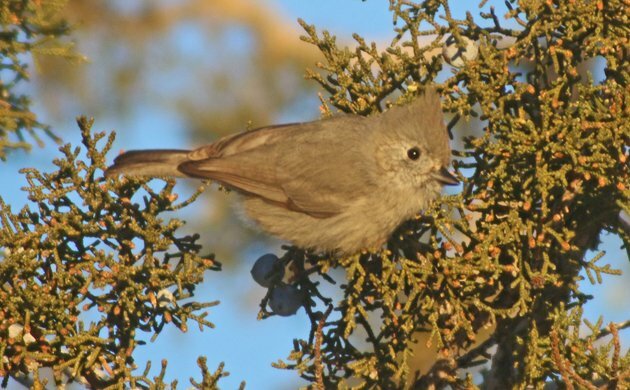 Juniper Titmouse used to be considered conspecific with Oak Titmouse, and they were collectively called Plain Titmouse, an incredibly accurate moniker. 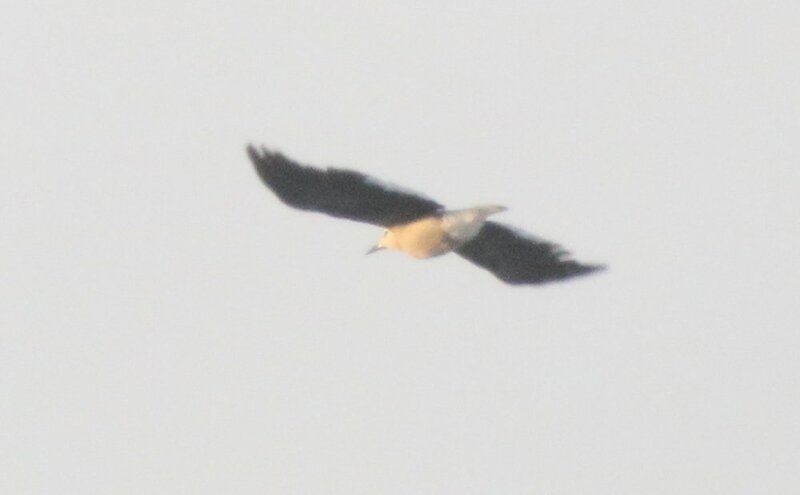 Plain as it was, I was still pleased to see one because it was a lifer! Red-breasted Nuthatches were amazingly common. They really liked the pinyon pines. 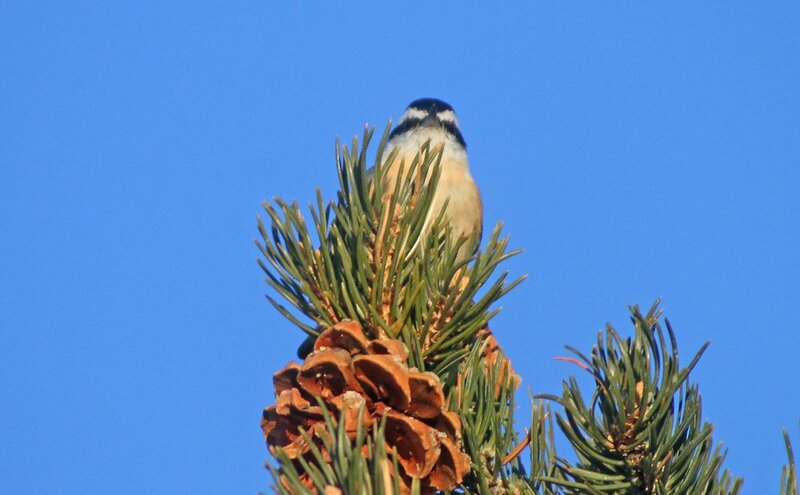 I am always pleased to see Mountain Chickadees. They are inherently superior to their Black-capped cousins. 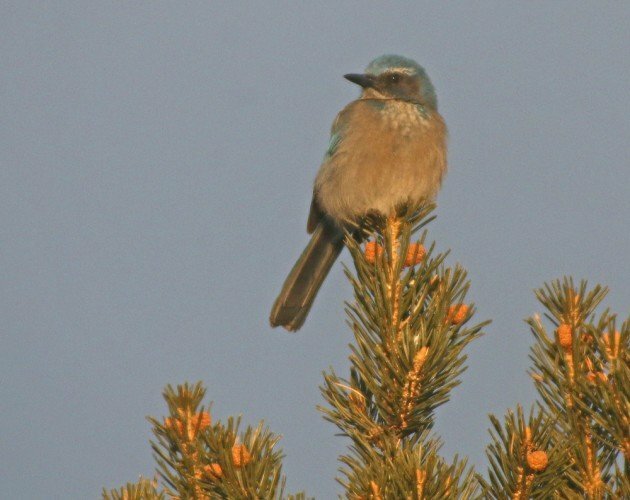 It seemed to me like Western Scrub-Jays are as good as keeping a sentinel bird up as Florida Scrub-Jays. 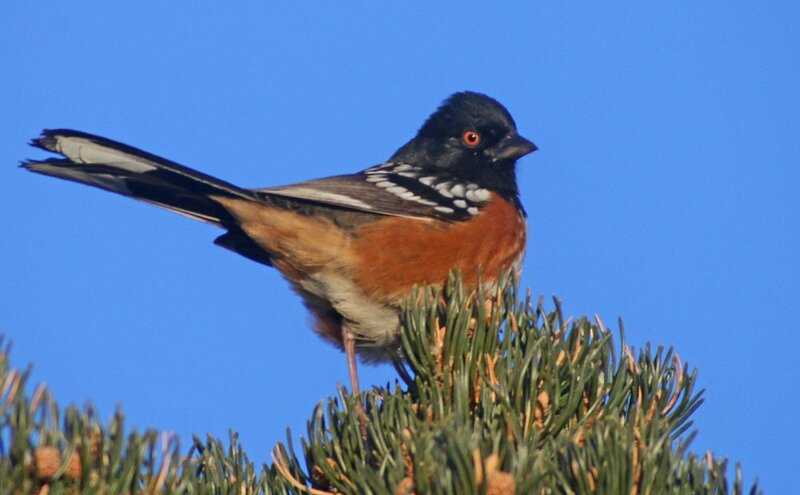 I think this picture of a Spotted Towhee pooping is the best bird-pooping picture I have ever taken. How gross is that? 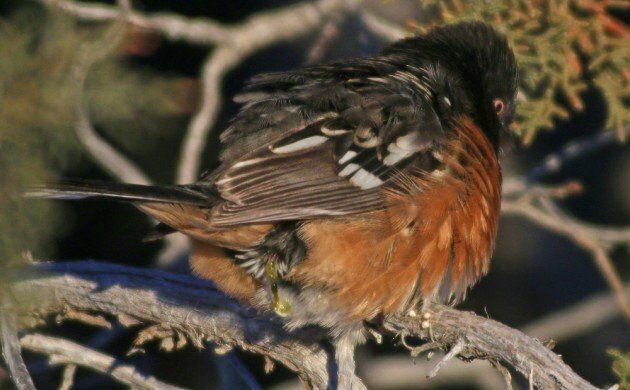 Imagine having to spread your feathers out in order to poop so you didn’t foul yourself and freeze. Here is a Spotted Towhee with dignity intact. This was the best shot I managed of any of the Clark’s Nutcrackers. Still though, ten! Western Bluebirds are inferior to their Eastern counterparts. Their calls are not as nice and they are just too easy to find. 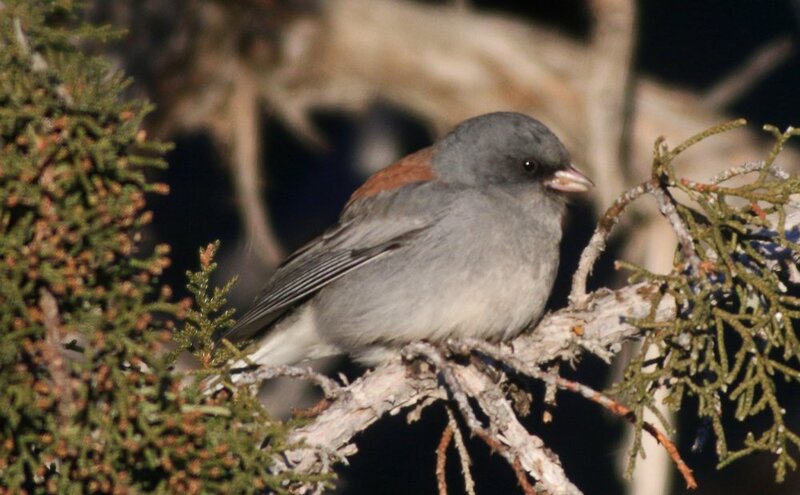 I don’t think I had ever before seen the Gray-headed Junco. Sure, it is just a race of Dark-eyed Junco but it’s a bird I had never seen before. So. Many. Red. Breasted. 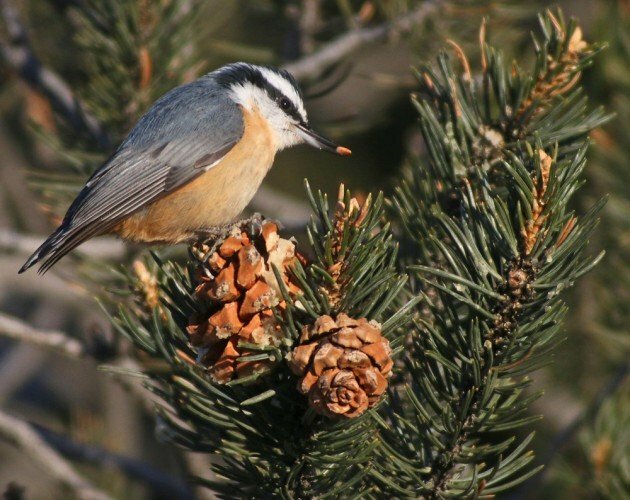 Nuthatches. Anyway, our day Sunday, once we managed to get everyone out of the house and into the cars, was spent exploring the core of Zion National Park, Zion Canyon. We started at the visitor’s center where the kids enjoyed some exhibits while the adults figured out which trails would be doable for the kids. We went with the easy option, the paved path that parallels the Virgin River, the Pa’rus Trail. It is an exceptionally easy trail, perfect for kids, level and with access to the river, which it crosses several times on sturdy bridges, at numerous places. 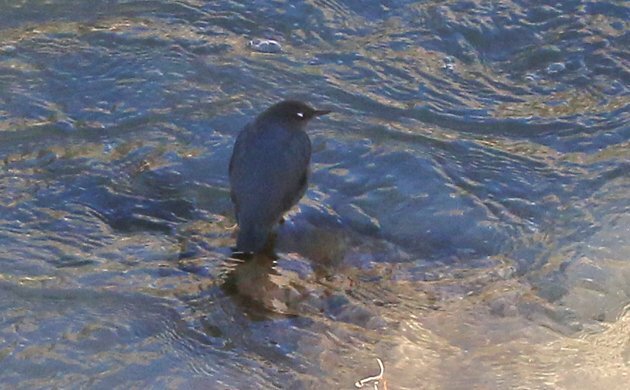 Every chance I got I scanned the river for a sight of my other prime avian target of the trip, an American Dipper, which I thought I would have a shot at in winter though the volunteer I spoke to indicated that they aren’t seen along the Virgin River at that time. Oh well, the trail was nice and the kids liked the nice looks at Mule Deer. 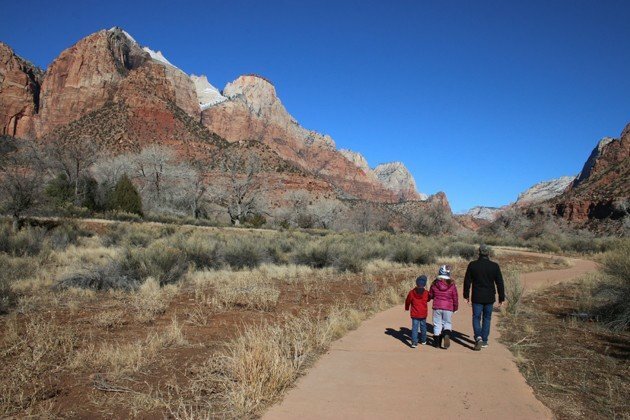 Desi and Audrey with their Uncle Matt walking the Pa’rus Trail at Zion National Park. We walked and chatted and oohed-and-aahed at the scenery and tried to keep the kids somewhat in line. I was pleased to see a Townsend’s Solitaire perched up at the top of a bare tree and several flocks of Bushtits too. Still no dipper. My niece Allyson did not care about my lack of a dipper. 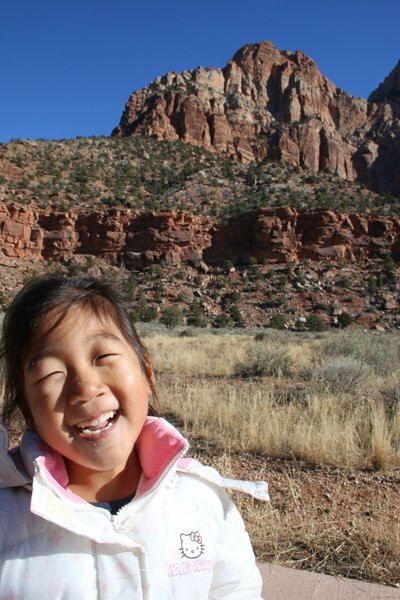 She liked Zion National Park…though she liked it even more when I told her to say “Doodoo Head” for the camera. Her parents, on the other hand, might not have been big fans, especially when she didn’t stop saying it. That’s what uncles are for, right? Then on one of my many scans of the river, I saw a dark, ball-shaped object standing on the rocky shore. I scanned past it, scanned back to it, and then it moved! IT WAS AN AMERICAN DIPPER! FINALLY! Exult in this horrifically bad photo of a dipper. Cool white eyelids though, right? After that sighting I didn’t really care what we did. An American Dipper in one of the most beautiful places in the country is an experience that will be tough to top. Though a couple of hours later I saw a second one. We spent the rest of our day exploring the scenic route through the canyon, getting out of the cars to hike a little bit and goggle at and take pictures of the scenery. It was hard not to let my brain explode everything was so beautiful. And while there wasn’t as much green as there must be in summer the white touches of snow and ice made the landscape seem more austere. 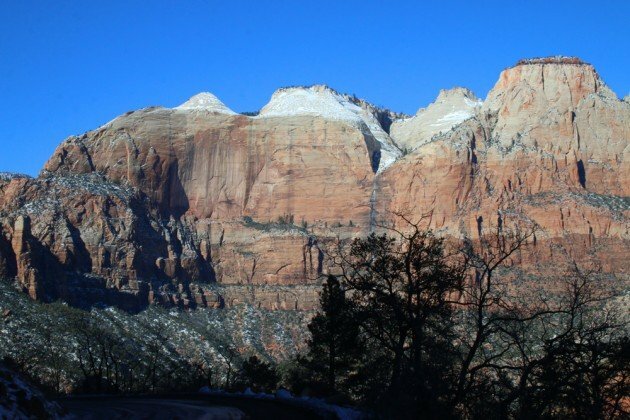 That and the ability to take our own vehicle, as you are allowed to do in the offseason instead of the shuttle bus, made a winter visit to Zion National Park a pretty special experience and one that I would highly recommend. Why wouldn’t you want to go to Zion National Park at any time of year? Sounds like a good time was had by all, Corey! 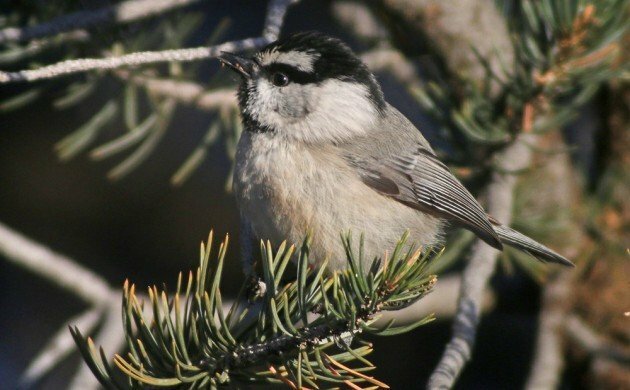 Just curious, what do Mountain Chickadees have over their eastern cousins? They have more panache with their jaunty racing stripe! Congrats on the lifers, especially the big Dipper! Thanks! It made me SO FRICKIN’ HAPPY! Okay, I must have missed it. 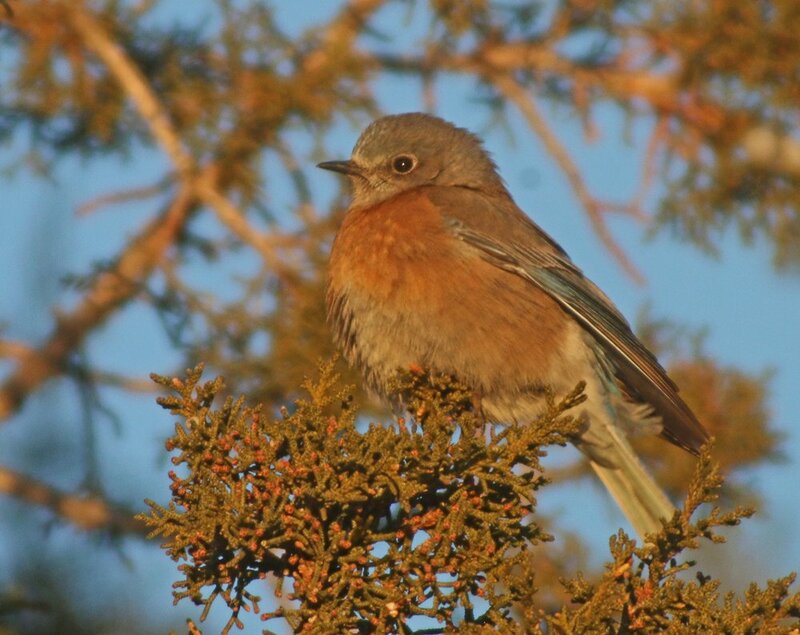 Surely you wouldn’t write a post on birding in Zion without a single reference to Bob Marley? I thought I would leave it to the master at such things! Here, I’ll give it a try: This place looks cold. I guess a Mountain Lion has to be iron in Zion. Why is the Robin’s Breast Red?